Dalziel Racing :: ​Interstate double and a Track Record as Dalziel Racing continues on its winning ways. ​Interstate double and a Track Record as Dalziel Racing continues on its winning ways. A promising filly and a track record breaking 3yo, that was the week that was at Dalziel Racing. As the sales season winds down we turn our attention solely back to the racing and it was a successful week on the track across two states for the Dalziel Racing team. 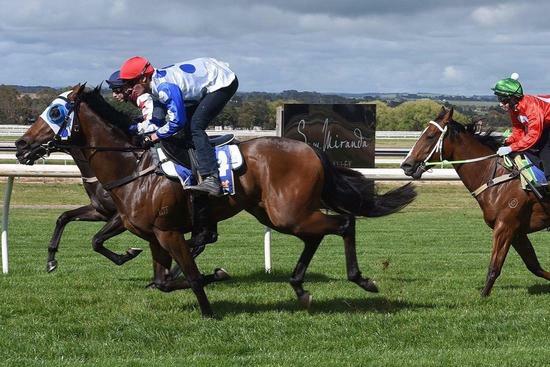 With the Adelaide carnival in full swing Wednesday's South Australian meeting was held at the good galloping track at Balaklava and it was a promising middle distance daughter of Foxwedge that stole the show. SCARLETT FOX (Foxwedge x This Way) was third up in the BM64 over 1600m with leading jockey Dom Tourneur in the saddle. The 3yo travelled well for the most part before Dom got to the outside on straightening to give her plenty of room to wind up in the run home. The filly was a little wayward over the concluding stages, wanting to drift back to the rail, however she finished powerfully and proved too strong for her rivals in what was a very good performance. In what is proving to be a lethal combination it was yet another winner for Dalziel Racing and the Stokes-Tourneur team. With the penny still yet to drop this big striding daughter of Foxwedge has plenty of upside and she looks to have plenty more in store as she matures in to her 4yo season. Just over 24 hours later and promising 3yo GLOBAL ROCKET makes it two in two days for Dalziel Racing with a track record win over the 1400m at Pakenham on Thursday night (Synthetic) The 3yo son of Smart Missile looked to be in a very awkward position buried back in the field on the rail, however the unstoppable Regan Bayliss produced a sensational ride to somehow get to the outside and unleash the Rocket as he stormed to his record breaking victory - beating the stablemate in the process! It was only Global Rocket's third career start and he seemed to relish getting out to the 1400m with a good even tempo and plenty of time to relax and find his rhythm. In what has been a tremendous period for the Lindsay Park operation Global Rocket proved he is heading in the right direction and looks like a horse that could work through the grades over the coming months. Well done to all of our victorious connections and another big thank you to our South Australian powerhouse team of Stokes and Tourneur and the might of our Victorian team at Lindsay Park in Euroa!